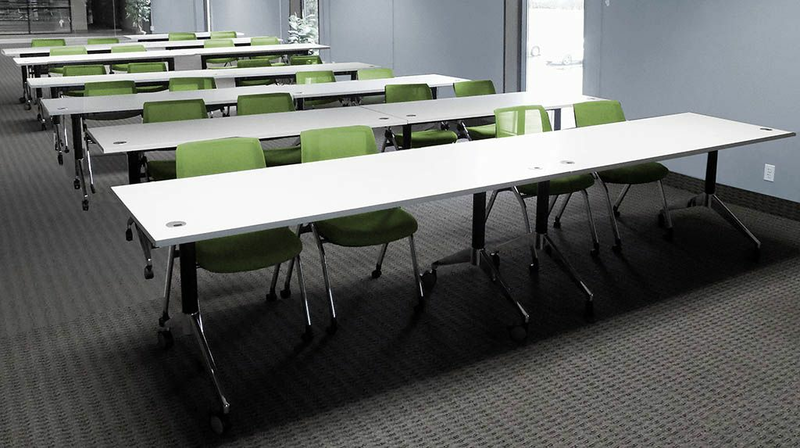 Looking for durable, affordable flip top training tables? 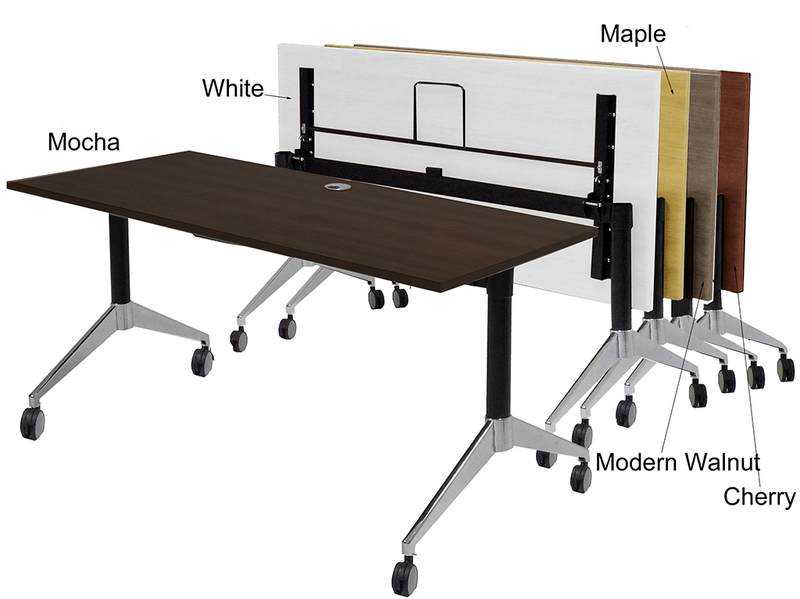 Our Flip Top Training Tables are sturdy, versatile and are an incredible value! 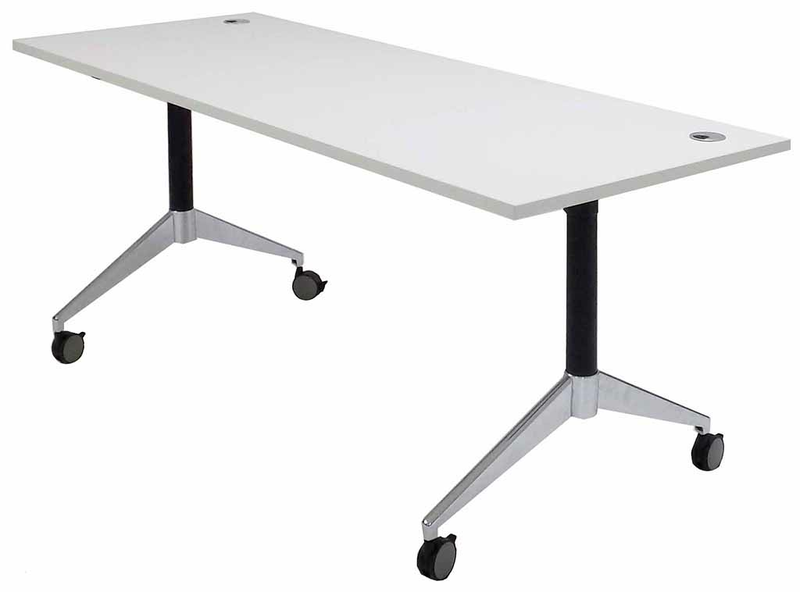 Feature locking casters, are easy to flip and store and are about half the price of other flip top training tables! 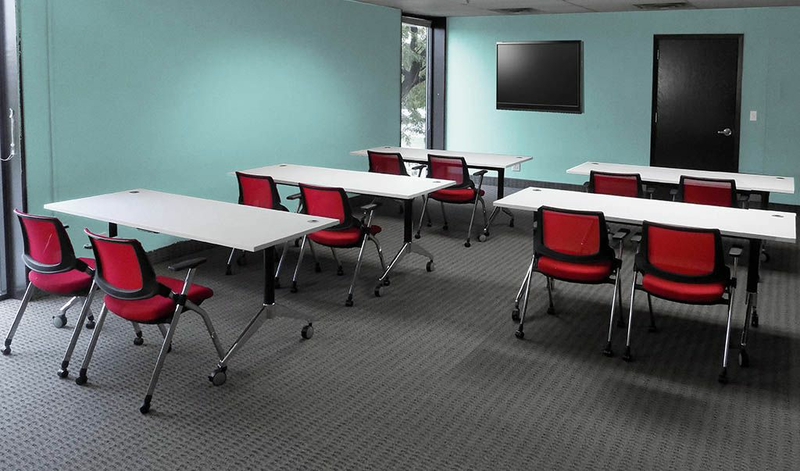 Technology-friendly design features built-in grommet in the table tops for routing cords and wires. 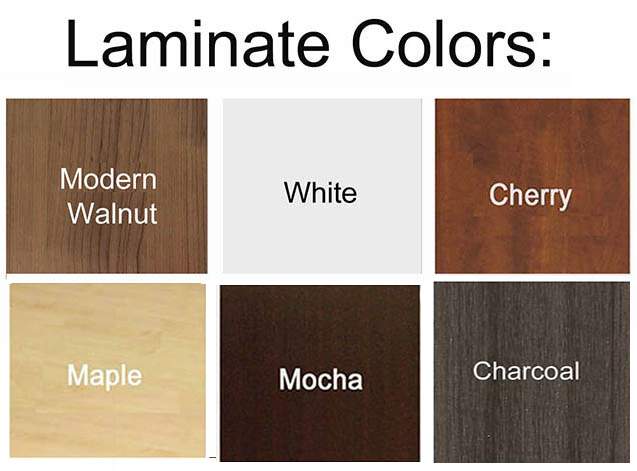 Choose from many attractive laminate colors and sizes! 60" x 24" Flip Top Training Table sold above. 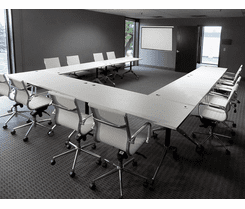 See 66" x 30", 72" x 28", and 72" x 36" tables below. 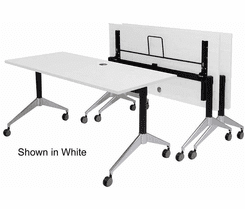 Flip Top Training Tables stand 29-1/4"H overall. Seat up to two people. Ships unassembled. Shipping weight is 68 lbs. PRICE INCLUDES SHIPPING! (Truck shipment - See Terms & Conditions). IN STOCK! 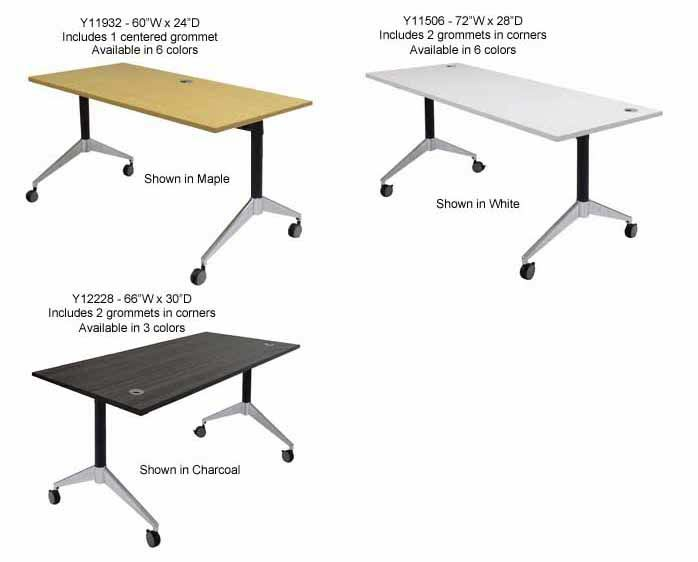 * Scratch-resistant laminate table tops with matching t-mold edging. 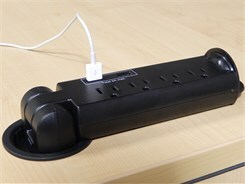 * Silver Grommets help keep cords neat and organized. 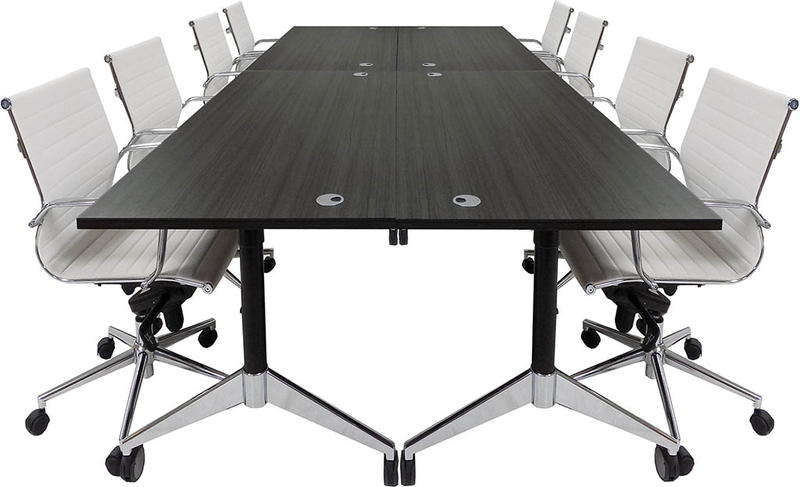 * 60"x24" Tables have one centered grommet. 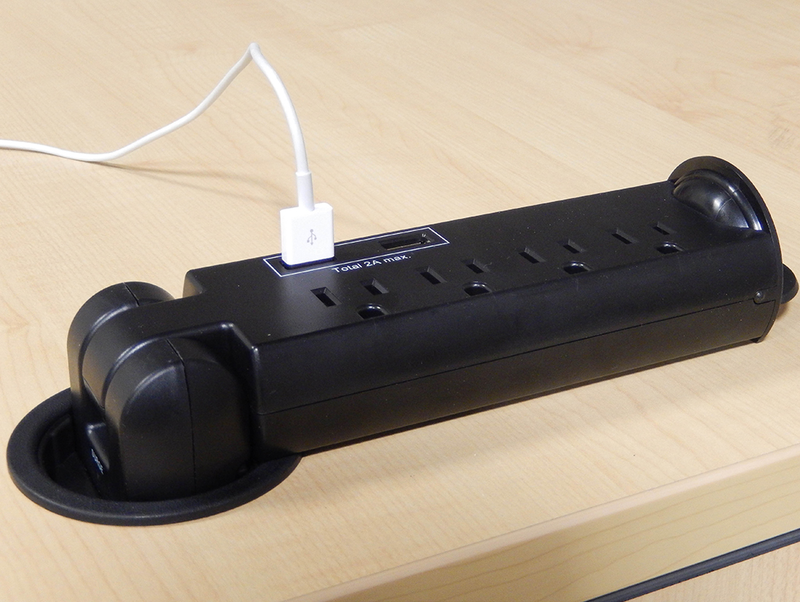 All other sized have two grommets in the corners of the table. 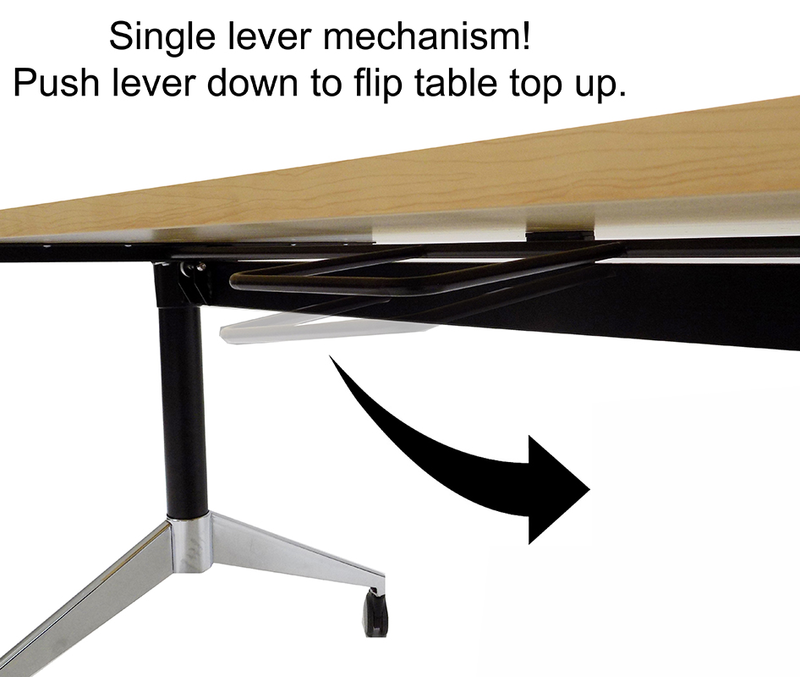 * Single lever flip mechanism allows you to easily flip up the table tops with one hand! 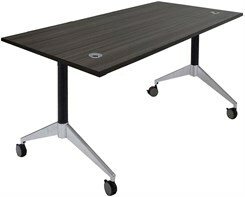 * Durable metal base features black table supports and chrome legs. 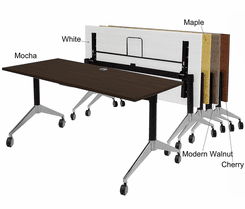 * Self-threading wood screws allow positioning of table top on base for your specific table configuration (back-to-back, in-line, etc.) Screws fasten directly into underside of tops for a firm and solid connection. 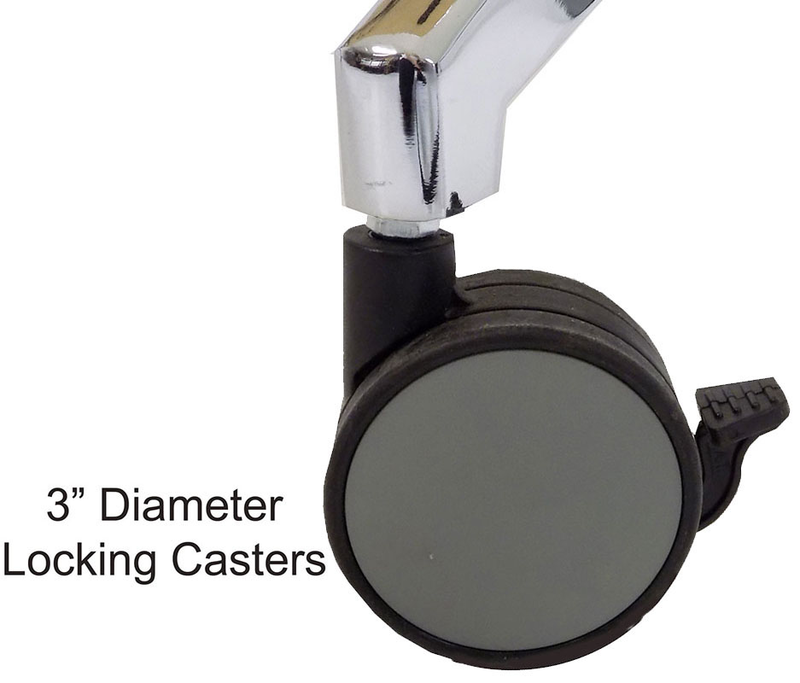 * 3" diameter locking casters. * Table tops are 1" thick. 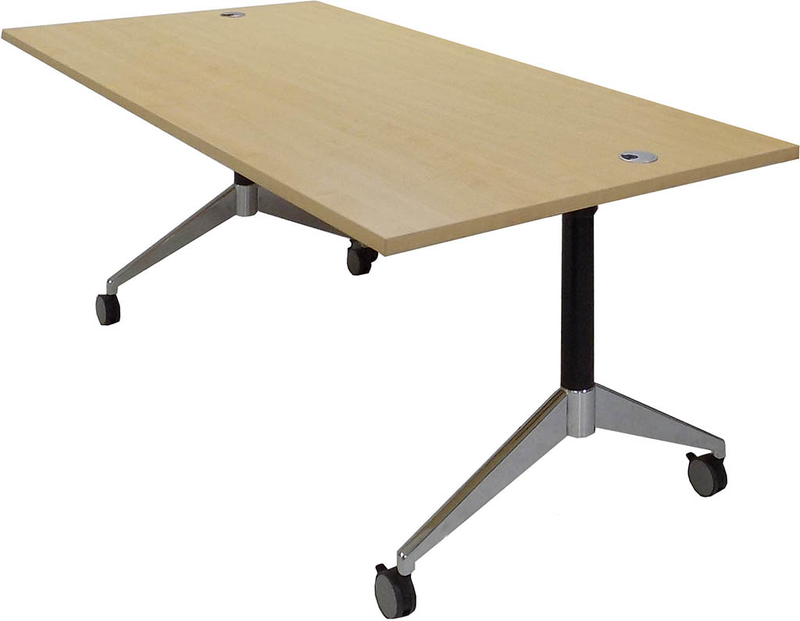 * Tables stand 29-1/4"H when in use and 42-1/4"H when flipped up. * Table bases measures 29"W deep, not including casters. 1 - 9 $349.00 ea. 10 - 19 $334.00 ea. 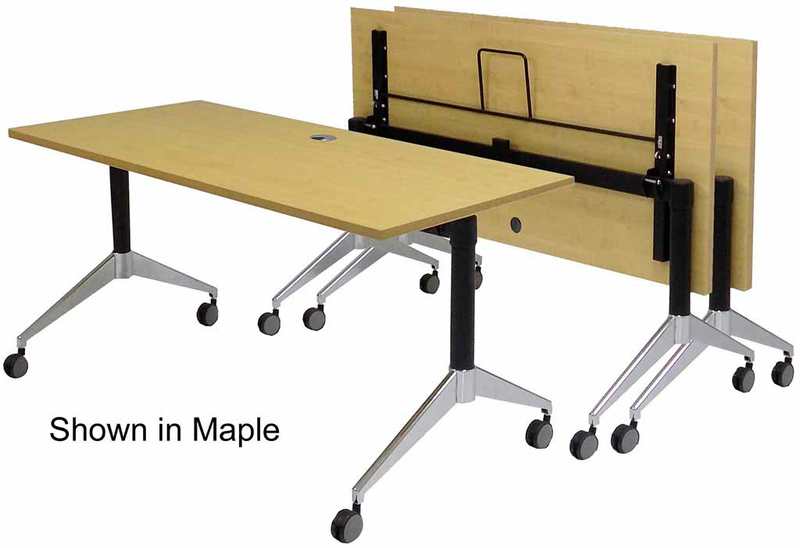 66" x 30" Flip Top Training Table seats up to two people but with more elbow room. 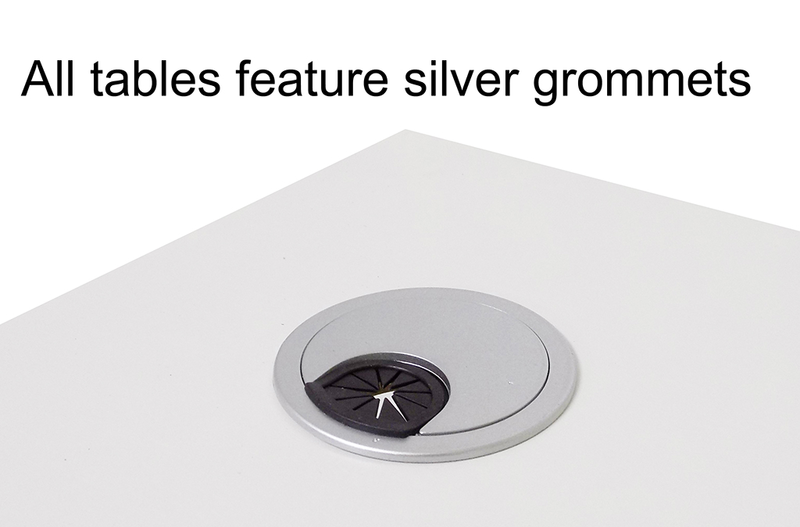 Includes table top grommet for wire management, 3" diameter locking casters, single lever flip-up mechanism and durable laminate table top. Stands 29-1/4"H overall. Ships unassembled. Shipping weight is 80 lbs. PRICE INCLUDES SHIPPING! (Truck shipment - See Terms & Conditions). IN STOCK! 1 - 9 $359.00 ea. 10 - 19 $344.00 ea. 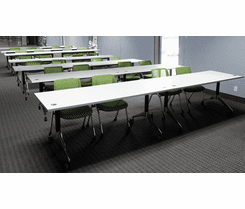 72" x 24" Flip Top Training Table seats up to two people. 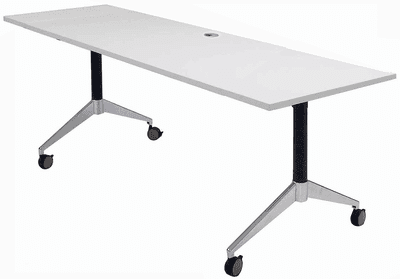 Includes two table top grommets for wire management, 3" diameter locking casters, single lever flip-up mechanism and durable laminate table top. Stands 29-1/4"H overall. Ships unassembled. Shipping weight is 78 lbs. PRICE INCLUDES SHIPPING! (Truck shipment - See Terms & Conditions). IN STOCK! 1 - 9 $369.00 ea. 10 - 19 $354.00 ea. 72" x 28" Flip Top Training Table seats up to two people but with more elbow room. 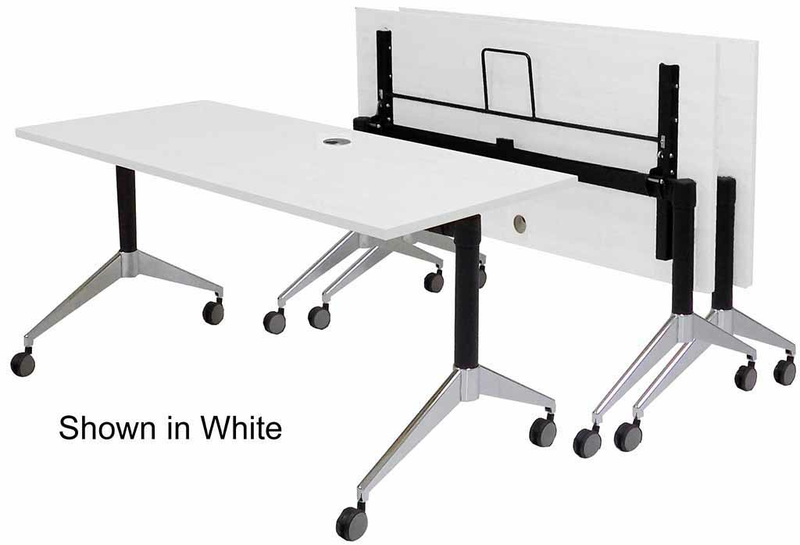 Includes two table top grommets for wire management, 3" diameter locking casters, single lever flip-up mechanism and durable laminate table top. Stands 29-1/4"H overall. Ships unassembled. Shipping weight is 80 lbs. PRICE INCLUDES SHIPPING! (Truck shipment - See Terms & Conditions). IN STOCK! 1 - 9 $399.00 ea. 10 - 19 $384.00 ea. 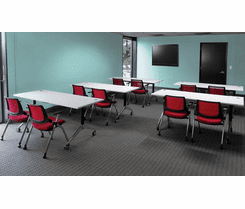 72" x 36" Flip Top Training Table seats up to two people with a spacious deep top. Includes two table top grommets for wire management, 3" diameter locking casters, single lever flip-up mechanism and durable laminate table top. Stands 29-1/4"H overall. Ships unassembled. Shipping weight is 90 lbs. PRICE INCLUDES SHIPPING! (Truck shipment � See Terms & Conditions). IN STOCK! 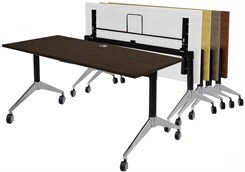 Flip Top Training Tables w/Privacy Panel - 60"x24" Top. See Other Sizes & Colors.